Customer retention is the unconquerable beast of SaaS. Although you can never retain every single customer, you should always aim to improve your customer retention strategy. It's the easiest—and the cheapest—way to lift your MRR and help your business scale. In fact, a SaaS Capital study found that reducing your churn by just 1% can increase your company's valuation by 12% in five years. Most PMs realize that inactive users are weeks, hours, or even minutes away from churning, so they send a few last-ditch sentimental emails and throw up their arms in defeat before turning their attention back to asimplcquiring new customers. But having a holistic strategy for reactivating users is paramount. To realistically prevent user inactivity, you have to take a deep dive into why customers are losing interest and address those issues. You'll prevent churn in the short-term, and you'll have the data to improve your overall customer retention strategy in the long-term. Here are five sure-fire ways to re-engage those inactive users. Onboarding serves as more than a step-by-step guide—it's a celebration of your product. It shows the new users everything the product offers, igniting excitement about the new tool. So who's to say you can only use it once? According to a Harvard Business Review study, the biggest reason that customers stop engaging is because the workflow isn't easy enough. If remembering how to use the app is too complicated, your inactive users will give up. 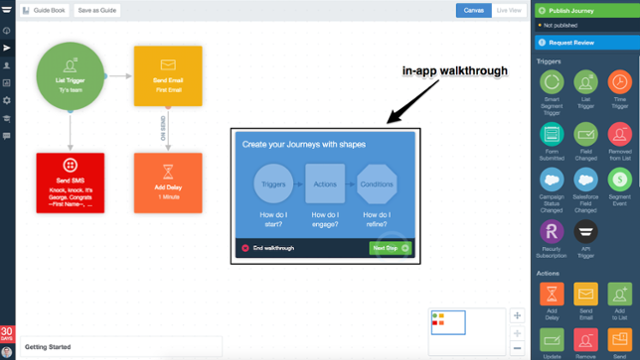 So make it super easy to relearn everything by re-onboarding them on their first visit back using an in-app walkthrough. And you don't have to wait around for your user to come back to your app themselves. 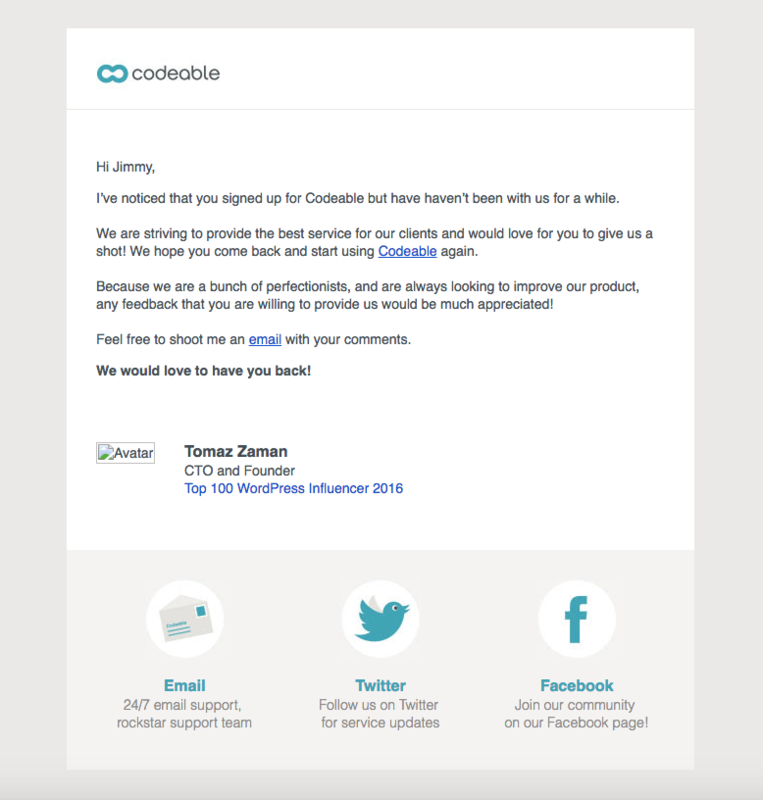 You can send a friendly email offering re-onboarding, or announcing a feature. Not only can you guide them through the best parts of your service again, but you can bring your product to the front of their mind, rekindling that spark they felt when they first subscribed. Autopilot has a helpful walkthrough that doesn't overwhelm the user with information and simply guides them. 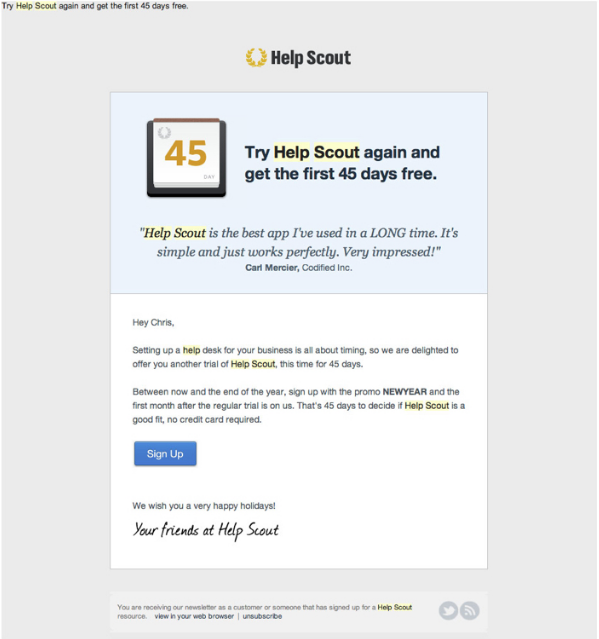 Use this same kind of simple onboarding to re-onboard users that have been inactive for some time. Users become inactive for different reasons. Some encounter friction in the onboarding experience, others find bugs in the software, and others just forget to check in. While a few of these issues are easily addressed, others are nowhere near the scope of your product plan. There's no better way to learn about customers' experiences with your app than hearing it straight from the horses' mouth. Send around surveys to learn how, and if, you can re-engage each type of customer. Send email surveys so that you can pinpoint what didn't work in the customer experience, and whether their issue with your product is something you can address expediently and directly. Before any general mention of what's in it for them, they say the benefit for the customer directly. Namely, getting “the best service.” This email successfully asks for feedback while making Codeable come across as super customer-centric. You can also use surveys to qualify users for the re-onboarding process. If there are particular features that a customer finds confusing, you can send an email to redirect them to a walkthrough on those features. The sales team has an established rapport with the users, so have them reach out and reconnect with the customers to help you figure out what went wrong. Large companies tend to avoid this because it's not feasible to call every customer, especially as their business continues to grow. But in the early days, you're still testing the waters for what works and what doesn't. Doing things that don't scale, such as establishing a personal connection with your customers, is crucial for you to learn more about your customer base and your product. The most effective channel of communication for your sales team is the phone. They can express their concern, hear the customers' tone, and be able to more accurately gauge the customers' impressions. A one-on-one with their first contact at your company can go a long way. If they're unhappy with the product, you can learn why, and if they're happy with it, you can remind them of its value. A Lee Resources International study revealed that for every customer who issues a complaint, there are 26 who don't and unsubscribe immediately. So if your customer support team only engages with customers once they've put in a ticket, they're missing 96% of customers' problems. Address this issue and re-engage your customers by asking your support team to provide proactive customer support. That means reaching out to inactive customers and reminding them that the team is ready and willing to help them with any issue. 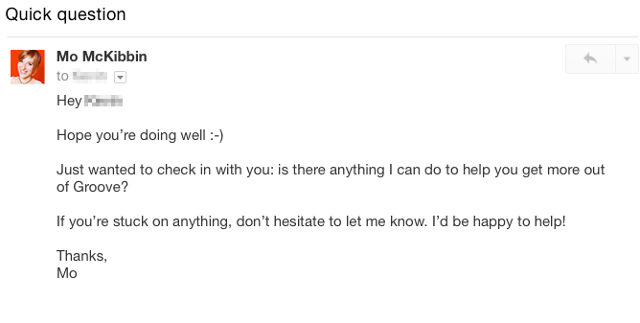 Have your customer support team send emails with helpful reminders. They can be instructions on how to start using the product, FAQs, or advice on different ways to use the app. Equipping users with selected pieces of manageable guidance will make the product more accessible and relevant. 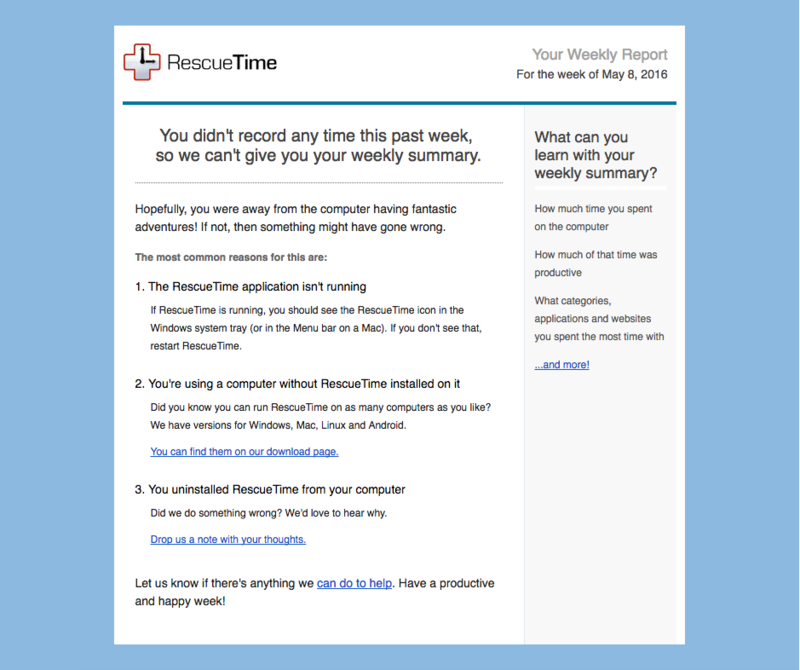 RescueTime did their research. They found the three most common reasons for inactivity and sent solutions. Lastly, they provided a link to a customer support page so that the user can let them know his own reasons for being inactive. This informal personal message makes Mo seem accessible and very willing to help. It also frees the user from the process of having to go through a ticketing platform to submit a complaint. Cold, hard cash can also do the trick. Tempt users back by giving them great offers with clear value. Most users give up on the product because they didn't spend long enough getting to know how it works. By enticing them with an extended free trial or a discounted upgrade, you'll give yourself more time to win them over. Of course this strategy won't work if there are deeper issues—such as UI preferences, bugs, compatibility issues, etc. But it can work wonders for the users who just need a little bit more convincing. ‍Free re-trial (one month free). The most important thing to note, however, is that it doesn't come across as an ad. It has holiday greetings, there's no credit card required, and the signature says “Your friends at Help Scout.” Incite your customers to keep working with you by offering helpful suggestions, not cheesy offers. Once customers have unsubscribed, you can forget them like a bad dream, right? Wrong. While it might seem counter-intuitive to think of a goodbye message as a customer retention strategy, not all customers are sure about their decision to leave. 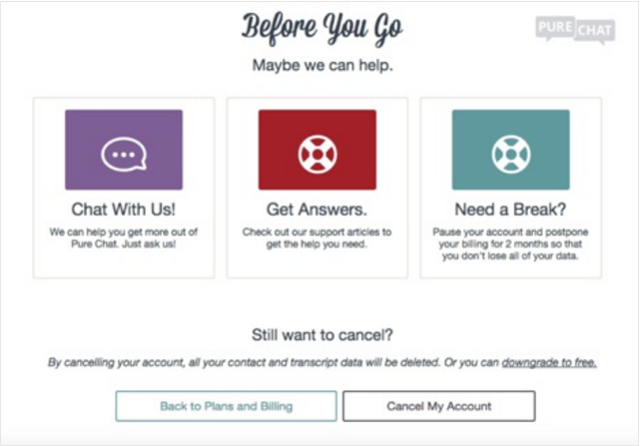 Sending a goodbye message lets you fight for your users to the last. In the message you can provide information on everything your inactive users will miss out on once they unsubscribe. This kind of reminder might be just what's necessary to bring them back. ‍One-click access to a support team. Re-engaging customers is too important to take lightly. In order to understand your product and your customers, you need a fool-proof re-engagement strategy, not a few last ditch effort emails. Reconnect with your customers—whether it's through in-app cues, email, or phone—and dig deep to find out why they are disengaged. Only then will you be able to prevent your inactive users from churning and improve your overall customer retention strategy.